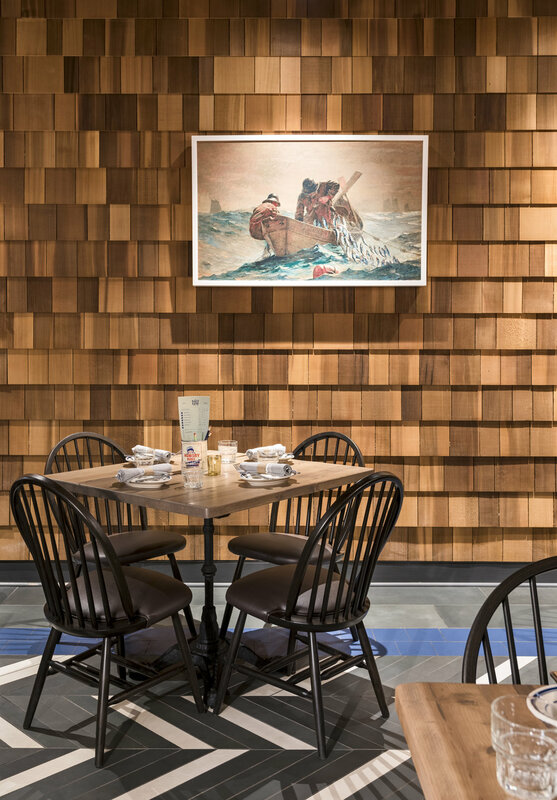 The Salt Line is a harmonious mashup between a New England and a Chesapeake Bay oyster bar. Gloucester meets St Michaels; casual meets sophisticated; Barnstable meets Barcat; heritage meets tradition. The restaurant serves gourmet food in a casual atmosphere that is comfortable for date night, after work snacks and pre ballgame brews. The design is light and airy, yet layered and textured and highlights traditional detailing in contemporary ways. Brass accents, custom light fixtures, handmade tile patters all lend layers of authenticity to the space. The Salt Line is also steps away from Nationals Baseball Park so we’ve worked in subtle nods to America’s pastime as well as references to the great east coast waterways. Menus are designed with an eye to scorecards, and art work has been selected with baseball themes. Did you know that baseball great, Ted Williams, is in both the baseball and bass fishing hall of fame? Who wouldn’t like to play ball and fish? There is a seaworthy dory hung from the ceiling of the private dining room and there are sailboat racing numbers in the bathrooms. Every surface and every position has been considered and there is not a bad seat in the house.